If you enjoy eating chips and salsa during the summer, I have good news for you: You might be helping to protect your skin from the sun. A recent study indicates that the key ingredient in salsa could also be key to fighting skin cancer. For this study, researchers at The Ohio State University gave male mice a specialized diet, 10% of which consisted of tomato powder, every day for 35 weeks. Then they exposed the mice to ultraviolet light. On average, the mice who ate the tomato-rich diet had a 50% decrease in skin cancer tumors than mice that did not receive the tomato-rich diet. The researchers believe that the carotenoids in the tomatoes, particularly lycopene, may help protect the skin from damage from UV rays. However, using a synthesized supplement of lycopene doesn't seem to offer the same protection as eating whole tomatoes or other food sources of the carotenoid. And the researchers also found that using tangerine tomatoes, which have higher levels of bioavailable lycopene, didn't provide a statistically significant improvement in tumor reduction compared to using dehydrated red tomatoes. The problem with this study is that it was conducted on male mice. So it may not translate to women. It could. But we need more evidence. Other studies in humans have suggested that eating tomato paste can reduce the effects of sunburns. So this study provides further evidence that compounds in tomatoes seem to work together synergistically to reduce the aftereffects of UV damage. These combined results also remind us of why it's so important to eat foods in their natural forms. We always need the whole food for optimum health. The co-author of the study, Jessica Cooperstone, noted that "foods are not drugs, but they can possibly, over the lifetime of consumption, alter the development of certain diseases." I agree. In fact, I'm inclined to argue that in many cases, foods are better than drugs because we get the benefits of all the compounds found in them, some of which we likely don't even know about yet. Season is irrelevant to lycopene. 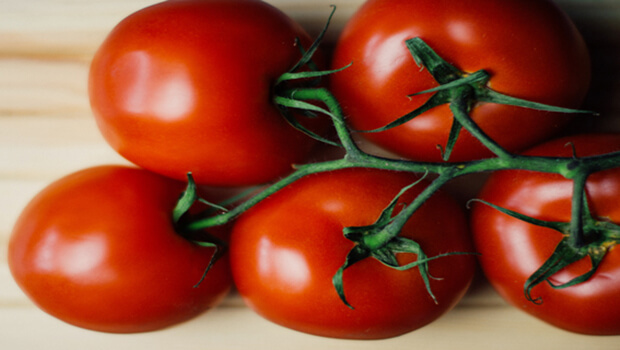 In fact, cooking increases the lycopene content of tomatoes - so Italian chefs have known something all along. No, ketchup on your French fries doesn't count. But salsa does! Just keep in mind that if you're enjoying your salsa or Caprese salad out on the patio, try to avoid staying in the sun too long without protection. While tomatoes may lessen the effects of UV damage, it's still better to avoid sustaining the damage in the first place. If you don't like tomatoes, you can get some of their benefits by taking Advanced Greens Formula, which has whole tomatoes as one of its many beneficial ingredients.